The average daily handle (the amount of money wagered) from all sources was $1.107 million, up 14.5 percent. 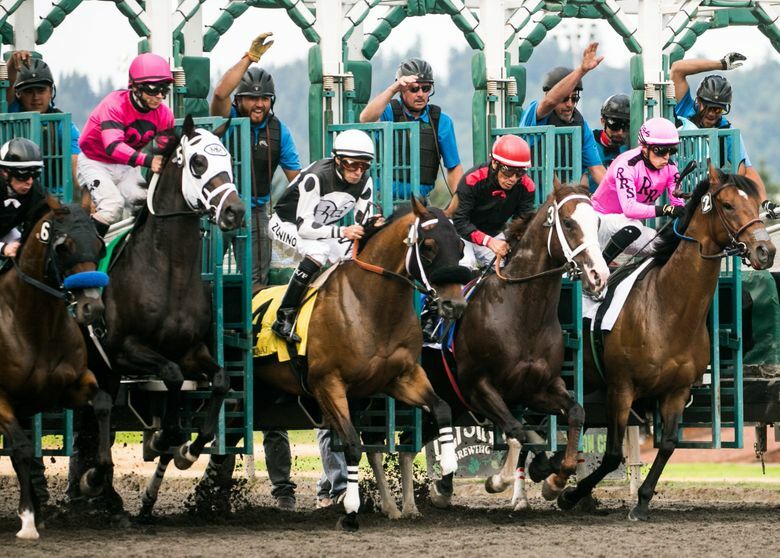 The amount wagered at the racetrack on Emerald Downs races was up 1.5 percent. Horse racing might be struggling in many locales, but Emerald Downs in Auburn continued to buck that trend in 2018. There was a healthy increase in the amount of money bet on races at Emerald Downs, which finished its 67 days of racing for 2018 on Sunday. Attendance was essentially the same after slight growth the past few seasons. The average daily handle (the amount of money wagered) from all sources was $1.107 million, up 14.5 percent from last year. The amount wagered at the racetrack on Emerald Downs races was up 1.5 percent. Average attendance was 3,741, Ziegler said, with season highs of about 14,000 on July 3, which featured a fireworks show, and more than 13,000 on Aug. 5, which featured corgi races. Average attendance in 2017 was 3,748. The average field size was up, from 7.0 to 7.1 horses per race. For the first time, the season started on a Sunday this year. The next two weeks had two days of racing, with three days a week beginning in the fourth week. Also new this year was the move from afternoon to night racing on Saturdays, beginning in mid-June. Because of that, Ziegler said, “I think next year’s schedule will be very similar to this year’s.” And he is optimistic for another good year. Sippin Fire was voted horse of the meeting, top 3-year-old and top Washington-bred as Emerald Downs announced its season honors Monday. Trained by Steve Bullock, Sippin Fire won a meet-high four stakes and earned $115,425 for owners How We Roll #4. He becomes the third 3-year-old to win horse of the meeting, and is the third consecutive gelding sired by Harbor the Gold to win the honor (Sippin Fire, 2018; Mach One Rules, 2017; O B Harbor, 2016). Rocco Bowen, regular rider on Sippin Fire, topped the 100-win mark for the third consecutive year while becoming the first jockey to win three straight titles at Emerald Downs. Bowen led in wins (109), stakes wins (six) and earnings ($1,065,618). Jeff Metz won his fourth straight training title, with 43 wins, while Blaine Wright led in stakes wins (nine) and earnings ($787,191). Wright also trained four different 2018 champions: Riser (sprinter and older horse), Reginella (older filly or mare), Bella Mia (3-year-old filly) and Baja Sur (juvenile male). John Parker and Saratoga West tied for leading owner with 17 wins apiece, giving Parker his third straight title. Northwest Factor, upset winner of the Gottstein Futurity, was voted top 2-year-old filly. Her owners, How We Roll #4, won six stakes and were No. 1 in owners’ earnings with $211,800. Papa Mambo, the meet’s only five-time winner, was voted top claimer. H.R. “Pat” Mullens was given the honor for top training achievement after becoming the oldest trainer to win a stakes at Emerald Downs at age 91. Hit the Beach won both the Muckleshoot Tribal Classic and Pete Pedersen Overnight Stakes and won four races overall for Mullens. Track reports were included in this report.